Five of the seven members of the Chicago Board of Education at the Board's January 2016 meeting. Left to right: Dominique Jordan Turner, Jaime Guzman, Frank Clark (Board President), Gail Ward, and Rev. Michael Garanzini. Not in this photograph are two of the Board members. Substance photo by George N. Schmidt. The Chicago Board of Education is preparing to approve a continuation of the controversial contract for school custodial services with Aramark corporation, and to expand or add other privatization deals as the nation's third largest school system continues its juggernaut of privatization and the attacks on union workers. The Board of Education, scheduled to meet on May 25, 2016, has never reviewed or studied any of its major privatization contracts. Instead, the Board has chosen to routinely approve the deals, since privatization, rather than well supervised professional (and union) services, is the ideology of the Board under Mayor Rahm Emanuel, just as it was under Richard M. Daley. The Board of Education agenda, which is released two days prior to each Board meeting, is more than 170 pages, and includes every "Board Report" (the form in which the Board is presented with items on which it votes) that can be made public. Under the Illinois Open Meetings Act, the Board must present the public with its agenda 48 hours prior to the beginning of the meeting. Exceptions include litigation, personnel matters, and discussions of real estate deals, which are allowed to be kept secret off the public agenda, but which become public if and when the Board decides, following its Closed Session, to approve items on these topics. Generally, the Board has had several secret items on its agenda at each meeting. The May 25, 2016 meeting of the Chicago Board of Education was forced by the Illinois Attorney General to hold its "sign up" for public participation following the public release of the Agenda. Since the election of Rahm Emanuel in 2011, the Board had refused to allow more than 60 people to speak at its meetings, no matter how many people wished to address matters of public concern. The Board also limits each speaker to two minutes, even if the speaker knows more about the topic under discussion than any of the current members of the Board. Prior to the Attorney General's April 2016 order regarding the Open Meetings Act, the Board of Education began "sign in" for public speakers one week prior to the issuance of the Board Agenda. It took an order from the Illinois Attorney General to force the Chicago Board of Education to begin signing up people to speak at the Board's monthly meetings after the Agenda for the meeting was published. Above, the Board is expected to approve this schedule for its meetings through December 2016 at the May 25 meeting. The Board continues to limit the number of people who can sign up to speak at 60 ("all slots are filled") despite the fact that the Board knows that there have never been 60 speakers at any of its meetings since the cap went into place. The Chicago Board of Education continues to defy both the Open Meetings Act and the Freedom of Information Act until it is ordered to follow the law by State of Illinois officials, and even then critics have documented massive stalling on the part of CPS officials. 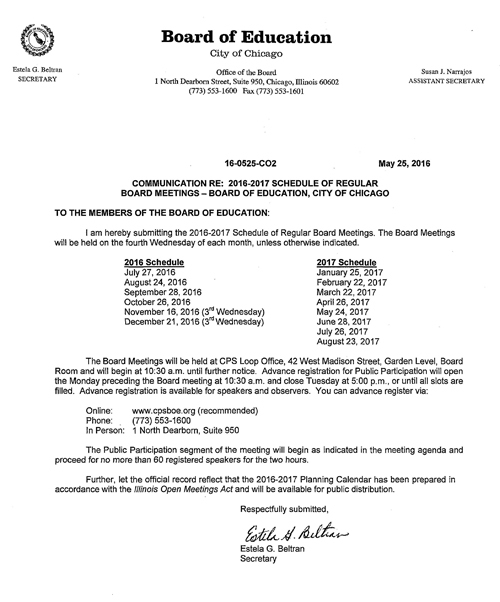 Above, the Board Report presented to the May 25, 2016 meeting announcing that the meetings through December 2016 will be held at the Board's downtown offices during "bankers hours" -- and not in any of the city's more than 600 public schools during hours when most working parents, students, teachers and other regular citizens can attend and participate in the meetings.The complaint against that practice was that the public had no way to know what would be on the agenda unless the sign-up took place after the Agenda was issued. The Agenda generally becomes available on line on the Board's website between 10:00 and 10:30 a.m. on the Monday prior to the Board meeting (unless the Monday is a holiday, in which case the Agenda is published on Friday). It was only after the complaint that CPS was violating state law that the Board of Education changed part of its practice. The Board will henceforth begin sign-up for public participation at its meetings following the publication of the Agenda for that meeting. The cap on the number of speakers, 60, is still in place despite the fact that the members of the Board of Education know that there have never been 60 speakers at any Board meeting. The cap of 60 is generally regarded as another method of gagging the public and undermining democracy in Chicago's public schools.